The arecanut palm is one of the important commercial crops of northeast India. Though the palm’s betelnut is used in various forms, the sheath is considered as waste. However, this waste generates income to local women who collect the sheaths which are a source for disposable dinnerware. Women on Wings, Oil Natural Gas Corporation and Tamul Plates designed a program that generated livelihood for 50 women in Assam. The program was successfully concluded. Plastic dinnerware are a major source of pollution across the world. The bio-degradable arecanut plates help to reduce this pollution and thereby mitigate climate change. The arecanut plates have better dimensional stability besides being hygienic, biodegradable and microwave safe. Due to its qualities, it has a huge market in India and internationally. There is more than 100,000 hectares of arecanut plantation in India’s northeast and more than 5000 arecanut plate micro enterprises can be promoted if only 50% of the available resources can be tapped. Each unit generates additional livelihood for around 30 people. Keeping this available resource in mind, Oil and Natural Gas Corporation Limited (ONGC), Tamul Plates Marketing Pvt Ltd (Tamul Plates) and Women on Wings designed a livelihood generating pilot program which was launched in June 2018 and had duration of six months. ONGC funded the entire program and Women on Wings actioned it in collaboration with its business partner Tamul Plates. 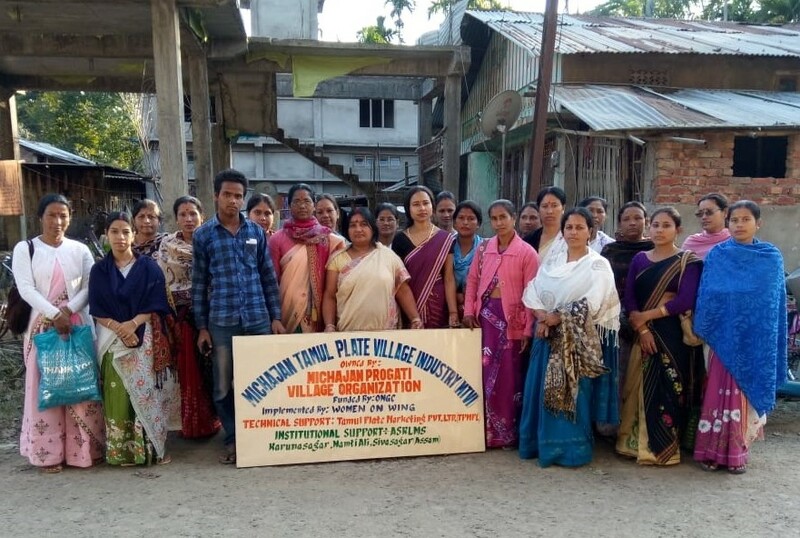 Tamul Plates provided technical services which included installation of new machinery, getting electricity connection, selection and training of women in Sivsagar district of Assam. There is a 100% buy back guarantee of the dinnerware to the producers who buy machines from Tamul Plates. Thus the producers need not worry about the marketing of plates. This means the program covered the entire value chain and provides sustainable income to the women involved. The activities that were conducted as part of the pre-training were explaining the basic plan and the expectations, like what contribution the women of the Self Help Groups (SHG) needed to make. It also included mapping the raw material availability in the region, selection of location for installing the machines and SHG members for training. And of course guiding SHG members to coordinate with support institutions like DICC, Electricity Department etc..
Next step was the on-site training which included understanding how to operate the machines, lectures & exercises, game based interactive sessions and field visit. Robust training was conducted which included machine installation, production process, operations management, entrepreneurial motivation and managing the external dynamics. The training had a major emphasis on practical on the job learning, but also covered theoretical and motivational aspects.